Classes already started this week in almost all school levels in the Philippines. 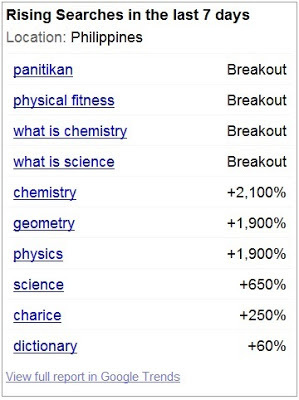 As we've checked with the no.1 search engine, Google and analyzed the most popular search items over the web for June 2-8, 2013, rising terms dominated mainly by education related keywords or topics. 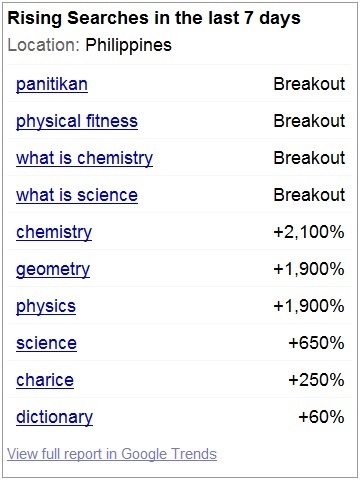 The top 10 most searched words this week includes 'panitikan', 'physical fitness', 'what is chemistry', 'what is science', chemistry, geometry, physics, science and dictionary. These educational topics even surpassed the search volume for controversial revelation of Charice Pempengco last June 2 aired by ABS-CBN. Charice on Google Trends is at no. 9 position only. It's really back-to-school month and the students need to refresh their minds in the school-related stuff. At the very first day of school, its normal that the teachers are asking for science-related topics that's why studes are preparing for an answer. With the advancement of telecommunication technology and coverage, mobile access to the internet for the instant search is now common. Internet become a major source of quality information for the new generation. Though 4 to 5 Filipino homes according to research this January 2013 have no internet access, but there'a petition to major telcos in the country to lower the broadband services. Having internet access will be of big help to Filipinos especially those students who sometimes have to stay late at computer shops to research on their assignments online.